Daiya fans, hold onto your seats! Or more precisely, hold onto your canvas bags of produce! The same goes for you, vegan Chicago style pizza seekers. The Portland Farmers Market in the PSU Park Blocks has doubled in size this season. With this expansion came new stands, including Via Chicago. This stand is open during the entire market hours (9am-2pm, currently) and offers mini breakfast pies and individual slice varieties. 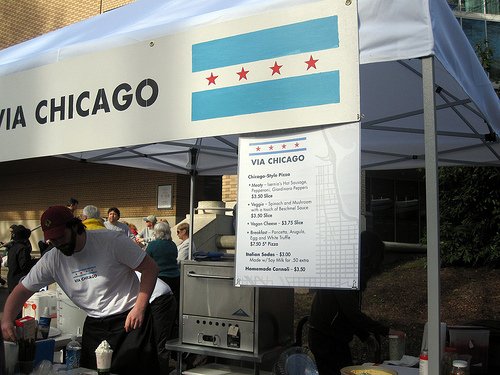 Via Chicago is located in the southwestern strip of food vendors. If you’ve hit the line of 30+ people waiting for biscuits and gravy, you’ve gone too far. Look for Via Chicago’s hometown flag adorned sign, proudly displayed underneath the awning above the front table where you order. They’ve been selling vegan slices ($3.75/each) since the first week of the season, and seeing a reliable increase in interest. Let’s give a round of applause for these early vegan option adapters! On two occasions I’ve stopped by for pizza and they were already sold out of the vegan slices. Fortunately, on the second occasion my friends and I were yet again, directly behind the person ordering the last vegan slice, we inquired about more and they were happy to make a new pie. Reminder to vegans – express your interest! The staff at Via Chicago are friendly and attentive to their vegan customers. They were excited to be offering the latest star of the vegan cheese world, Daiya. The soy-free vegan cheese obviously dominates the slice. Underneath the shockingly melty Daiya lies a semi-thick crust that was even tastier on my second visit. It’s not as deep dish as I was expecting, especially in our city where pizza crust tends not to be very thin. Being unfamiliar with truly traditional deep dish pizza, I was surprised that the tomatoes were portioned on top of the slice, as opposed to a level of sauce. You can actually see the tomato preparation going on behind the counter. I couldn’t take my eyes off of it – tomatoes are picked up out of giant cans, hand squeezed, and moved into a container for pizza use. 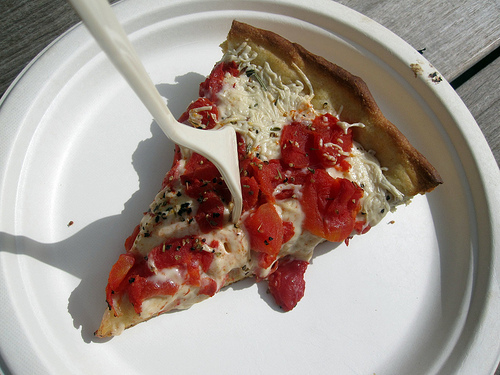 Once the bright red, diced tomatoes are strewn onto the pizza, dried Italian herbs are sprinkled on top. Like a whole lot of vegan pizza in Portland, a fork and knife can come in handy here. Daiya does its job and packs a lot of goo. I don’t think any other vegan cheese would compare here. The first few bites are a generous experience, but as someone who’s not obsessed with the revolutionary Daiya, I’ve found myself wishing there was something more. I’d love to see these slices with an addition to the chewy tomatoes and flood of vegan cheese, such as local mushrooms and peppers, to keep with the farmers market tradition. The menu’s vegetarian slices seem to pull it off. Vegans like vegetables too, we promise. As previously mentioned, Via Chicago truly deserves credit for being so aware of the Portland vegan community. They’re already joining Black Sheep and Tastebud, among others, in offering prepared vegan food options during the farmers market experience. There is a small oven on site, and they have the capability of preparing new pies, as mentioned, and warming slices upon order My wait for a warmed slice has only a few minutes, and the wait for a new pie was within 30 minutes. Large pies are kept protected underneath large plastic covers. Once you have your plated slice, take it to any available ledge in the Park Blocks, make an impromptu picnic, or venture to the PSU Smith building’s downstairs cafeteria for some secret shade and quiet. In addition to pizza, you can veganize their Italian Sodas with soy milk for a bit extra, which puts them above $3 each. I’ll stick to $3.75 for a fairly filling slice of pizza as my non-vegetable indulgence at the market. If you’re hungry, get 2 – before they sell out! Vegan Cheese on the brain? Check out Stumptown Vegans Podcast Episode 14: The Popularity of Vegan Cheese. Hm. Why don’t they put mushrooms and spinach on the vegan? tomatoes aren’t my favorite in general, but that being the only veg is just sad. I think i’d rather have a $3 cheeseless veggie-full slice at Hot Lips. That’s Chicago Style. Tomatoes on top of the cheese with no sauce. I ate hear the previous Saturday, and was not impressed. Thank you for offering another vegan “option” but since Daiya is now offered in packages at your local grocer, any and every business can now claim vegan options by simply purchasing the stuff. The slice was extremely small for $3.75, and I would much rather go to Bella Faccia, Pyro Pizza, Hot Lips, my own kitchen, you name it, then go here again.